On this page of Endangered Animal facts we list facts about the beautiful and deadly Bengal Tiger. In the list below you will find information on what has pushed this amazing species to the brink of extinction, where the few remaining members of this species live, and how people are trying to protect it. This information is written for both kids and adults. 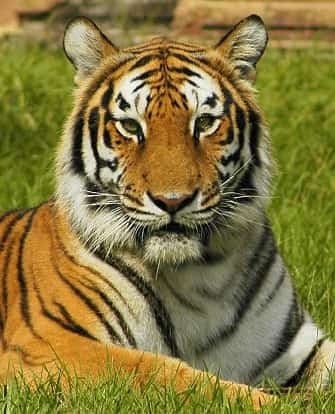 Click here for a great selection of Amazon.com books about Bengal Tigers. Although endangered it is the most numerous of all the tiger subspecies. These animals live in India with much smaller populations in China, Bangladesh, Bhutan, Burma, and Nepal. Their natural habitats are forest, tropical rainforests, swamps, and mangroves. This animal is built for hunting. It has many adaptations that aid its hunting including sharp teeth and claws, excellent eye sight, and speed. Orange fur and black stripes serve as great camouflage, blending it into the shadows of the forest and tall grass in which it hides and waits for prey to approach. Its paws have soft pads enabling it to quietly sneak up on prey. This animals scientific name is Panthera tigris tigris. The roar of this huge cat can be heard from up to two miles away. The Bengal Tiger is one of the worlds most famous predators; it feeds on a variety of prey including deer, boars, monkeys, antelope, and birds. A female Bengal Tigers pregnancy last from 3 - 4 months. Litters range from 2 - 4 cubs. Bengal Tiger cubs stay with their mothers for approximately 18 months after birth as they learn survival skills such as hunting. Bengal tigers are generally solitary animals. They mark their territory and have very little tolerance for other Tigers entering their area. This species life expectancy is 8 to 10 years in the wild. It has been listed as an endangered species by the IUCN (International Union for Conservation of Nature) since 2010. It is estimated that fewer than 2000 Bengal Tigers now live in the wild. Poaching is the biggest immediate threat to their survival. Tigers have been a target of hunters and poachers for many years. They have been targeted for many reasons including their beautiful pelts. In some areas of the world it is believed consuming parts of the tiger will provide you with strength. The survival of this species is not only threatened by poaching but also by a loss of their natural prey and a loss of their natural habitat due to deforestation. This deforestation is increasingly causing these animals to attack domestic animals and sometimes humans. Humans will often kill them to protect themselves and their livestock. This tiger has an orange fur coat with black or dark brown stripes. The belly and inward facing part of its legs have white fur. The tail is orange and has black rings. The average length, from nose to tail, of males of this species is 9 - 10 feet (2.7 - 3 meters), with females being slightly smaller. This tigers tail is on average 2.75 - 3.6 feet (.83 - 1.1 meters) long. The average height at the shoulder is 2.9 - 3.6 feet (.88 - 1.1 meters). The average weight of the males is 488 pounds (221.2 kilograms) where as the females average weight is 308 pounds (139.7 kilograms).